Wolf Schröder, who refers himself as a “Korean American Guy” in spite of zero percent of Korean blood in him, said through Twitter to give a tip on how to spend the holiday alone. 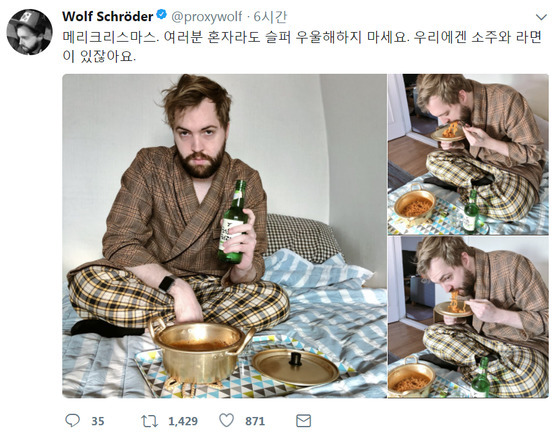 In the pictures uploaded with the message, he is eating ramen in a pajama, holding a bottle of Soju in one hand. The eSports Broadcaster living in Korea, Wolf Schröder is already widely known among social media users in Korea, especially for his love for Korean cuisine. Including his favorite Korean dish Budaejjigae (which he even gave a hypocorism “Bujji”), Wolf enjoys all kind of Korean food ranging from the beef intestine to sundae. When he has to travel abroad, Wolf brings several packs of ramen with him. Here are some of his Tweets show how much he loves Korean cuisine. Last year on New Year’s day, Wolf cooked Tteokguk himself to celebrate the day with a traditional Korean dish eaten during the celebration of the Korean New Year. We wonder how he will spend the holiday this year!